Big, thick and juicy caveman lollipops! If you've ever wandered around a fairgrounds anywhere in North America I'm sure you've seen people munching away on these huge BBQ Turkey drumsticks. Two secrets to making these at home - soak them in a spiced brine overnight and then slow roast them (if you can) over a charcoal fire. If not, indirect low heat on your gas grill works too. 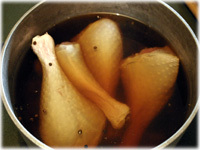 Soaking the drumsticks in a brine before cooking is not only easy but it guarantee's the turkey meat stays full of flavor and juicy for the longer cooking time. 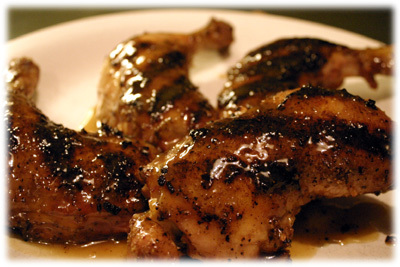 Baste a couple times with a lemon peppercorn butter and then slather on a nice zesty BBQ sauce to give these drumsticks a nice sticky gooey crust. In a large sauce pan bring the 1/2 gallon of water to a boil and add the salt and sugar stirring until dissolved. Reduce the heat to a gentle simmer and add the ginger and peppercorns, continue to simmer for 10 minutes. 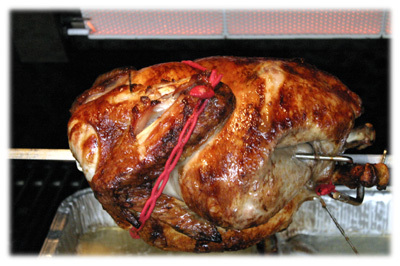 Allow the brine to cool and place the drumsticks in the brine, cover and refrigerate overnight. 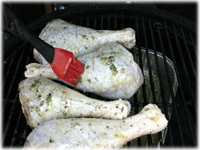 Set up the BBQ or grill for indirect cooking and place a disposable aluminum pan half filled with water directly under where the drumsticks will be cooking. Combine the melted butter, lemon zest and juice, pepper corns and thyme and mix well. 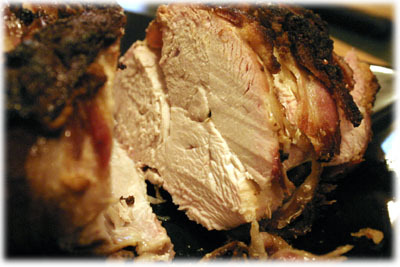 Remove the turkey drumsticks from the brine and pat dry. Place them on the preheated grill and baste all sides with the butter mixture. After 1/2 an hour baste the drumsticks with the rest of the butter mixture and close the lid. 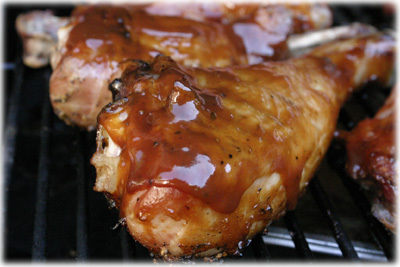 After 20 minutes start slathering some of your favorite BBQ sauce on the drumsticks and continue to turn and slather more sauce on every 20 minutes. 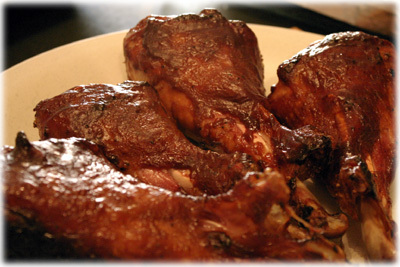 After a couple hours or when the internal temperature of the meat is 165F remove the drumsticks from the BBQ and serve immediately.